Bishop Simon Bruté College Seminary in Indianapolis was brimming with life from June 21-23 as 40 teenage boys from across central and southern Indiana and beyond participated in the 12th annual Bishop Bruté Days. Sponsored by the archdiocesan vocations office, Bishop Bruté Days gives high school-aged boys open to the idea of the priesthood an experience of what daily life is like in the archdiocesan college seminary, including Mass, the Liturgy of the Hours (also known as the Divine Office), eucharistic adoration, opportunities for the sacrament of penance, recreation time, shared meals and presentations on the faith. It was the third time that James Hentz, a member of St. Michael Parish in Greenfield who will be a junior at Father Thomas Scecina Memorial High School in Indianapolis, attended Bishop Bruté Days. “It kind of gives an early taste of what seminary life is like,” said James, who attended the event with his younger brother Anthony. “You have all of these guys here who are actively discerning. Isaac Nord, a member of St. Gabriel Parish in Louisville, Ky., in the Archdiocese of Louisville, participated in Bishop Bruté Days for a second time. Will Yunger, a member of All Saints Parish in Dearborn County, was attending his third Bishop Bruté Days. He will be a sophomore at Oldenburg Academy of the Immaculate Conception in Oldenburg during the coming academic year. 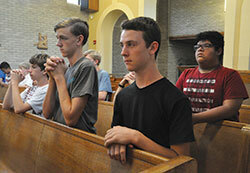 Father Eric Augenstein, archdiocesan vocations director, said the annual gathering helps him get to better know young men who have participated in other vocations-related events sponsored by his office. One of them is the Called by Name dinners, where young men open to a priestly vocation share a meal and hear priests describe the story of their path to the priesthood. A young man who attended a dinner and then participated in Bishop Bruté Days was Bryce Dixon, a member of St. Malachy Parish in Brownsburg, who will be a junior at Brownsburg High School in the fall. He appreciated the added depth in learning about discernment that was offered during Bishop Bruté Days. “Here, you’re not learning about how they discerned their path,” said Bryce. “You’re in the action of seeing people discerning their paths now. You’re seeing the seminarians doing it. Father David Marcotte, chaplain at Roncalli High School and the University of Indianapolis, both in Indianapolis, celebrated Mass at the seminary during Bishop Bruté Days and shared lunch with the participants. 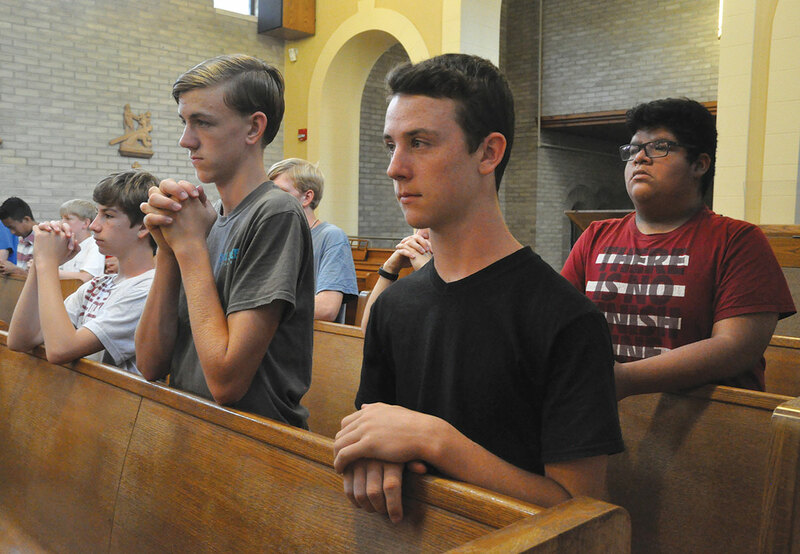 An alumnus of Bishop Bruté, Father Marcotte appreciated the way the summer gathering helps teenage boys discern their vocation. To encourage this support of discernment in families, this year’s Bishop Bruté Days included for the first time the involvement of the families of the participants. At the end of the event, Father Augenstein addressed the parents and siblings of the participants and then welcomed them to a cookout at the seminary. More families than just those of Bishop Bruté Days’ participants are coming to know the college seminary. Father Augenstein anticipates that around 10 new seminarians will enter priestly formation for the archdiocese in the upcoming academic year, with the majority of them being enrolled at Bishop Bruté. Father Joseph Moriarty, Bishop Bruté’s rector, added that the seminary is expected to be at its capacity with 52 seminarians in the fall, an increase from 42 during the last academic year. One religious order and 10 dioceses from five states are expected to have seminarians at Bishop Bruté beginning in August. Seminarian Charlie Wessel, a member of St. Simon the Apostle Parish in Indianapolis who will be a junior at Bishop Bruté in the fall, was encouraged by seeing so many Bishop Brute Days’ participants and getting to know some of the new archdiocesan seminarians who helped lead it.